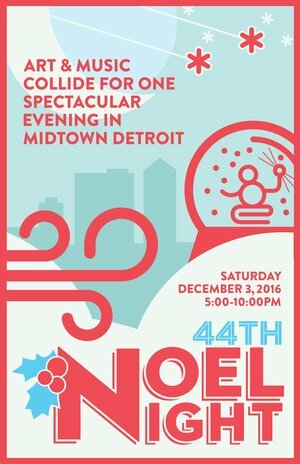 Positive Detroit: Largest Noel Night Ever In Midtown This Saturday, Dec 3! Largest Noel Night Ever In Midtown This Saturday, Dec 3! Now celebrating 44 years, Noel Night will be held Saturday, December 3rd, 2016, from 5:00 p.m. to 10:00 p.m. True to its roots, Noel Night continues to be a Cultural Center-wide “Open House,” celebrating the city’s diverse holiday traditions amid the state’s premier arts and cultural institutions, historic churches, galleries, and ever-growing circle of small businesses and restaurants, providing the perfect backdrop for a festive evening packed full of performances to enjoy with family and friends—all free of charge. Horse-drawn carriage rides, carolers, music, dance, theatre, children’s make & take activities, unique shopping, holiday delectables, and visits with Santa are all part of the evening’s festivities. Noel Night continues to grow each year, now featuring 100 different venues and recently attracted 40,000 visitors in 2015. Over 200 performances are sure to bring the sounds of the season to life. Click HERE for the Full Noel Night Schedule, Special Installations, Parking & Directions!